Meola played for the United States national team at the 1990 and 1994 World Cups (third-choice goalkeeper at the 2002 World Cup behind Brad Friedel and Kasey Keller), and from 1996 to 2006 played in Major League Soccer, the U.S. top soccer division, where he obtained multiple honors. He currently plays for charity team Global United FC. In 1999, he was named by The Star-Ledger as one of the top ten New Jersey high school soccer players of the 1980s. Meola not only excelled at soccer, he was a three-sport varsity letterman. He was the captain of the school's basketball team and was named an All-State baseball player in 1987. The New York Yankees drafted him out of high school. Meola later played in their farm system. Meola, born in Belleville, New Jersey, grew up in Kearny, New Jersey and played boys soccer for Kearny High School, in Kearny, New Jersey. He learned his love for the game from his father, Vincent, who had played for Italian second division club Avellino before immigrating to the U.S. Tony was All-State both as a goalkeeper (1985) and a forward (1986). He had a part in 41 shutouts and scored 42 goals during his high school career. Meola attended the University of Virginia on a soccer/baseball athletic scholarship. While at Virginia, he played under coach Bruce Arena. By the time he was playing for the Cavaliers, he had already begun to make a name for himself on the international scene. In October 1987, he backstopped the U.S. U-20 national team at the 1987 FIFA World Youth Championship. One of the greatest goalkeepers to play college soccer, he earned first team All American honors both his freshman and sophomore years. He also won the Hermann Trophy as a freshman in 1988 and the MAC Award as a sophomore in 1989. On December 15, 1989, he announced that he was leaving U.Va. to pursue a career with the U.S. national team. He also was a varsity letterman for the U.Va. baseball team. Meola had signed with the U.S. Soccer Federation before the 1990 FIFA World Cup. Following the cup, Meola signed on loan with English club Brighton & Hove Albion where he played eleven games, only two were league games. He gained his first start when he replaced the injured Perry Digweed and promptly won man of the match honors. On September 14, 1990, Meola was transferred to Watford before moving back to the U.S. He returned to the U.S. after he was unable to renew his work permit due to his inability to gain first team time with Watford. In 1991, Meola played for the Fort Lauderdale Strikers of the American Professional Soccer League. He shared the goal with Arnie Mausser. On December 14, 1994 Meola signed with the Buffalo Blizzard of the NPSL in the 1994-1995 indoor season. He became the team's starting keeper, but on January 31, 1995, he announced that he had taken a lead role in the off-Broadway play Tony and Tina's Wedding. He played five more games with the Blizzard before leaving to join the cast on February 16. In February 1995, Meola joined the Long Island Rough Riders for its upcoming 1995 USISL season. That year the Rough Riders claimed the USISL championship. Upon the creation of Major League Soccer, he was allocated to the NY/NJ MetroStars, for whom he played between 1996 and 1998, starting almost every game. However, before the league began play, he spent three weeks in February 1996 training with Italian club Parma. During his time with the MetroStars, he set a league record with nine shutouts in 1996. He did not win the MLS Goalkeeper of the Year Award, however; the honor went to Mark Dodd. Meola was traded to the Kansas City Wizards (with Alexi Lalas for Mark Chung and Mike Ammann) in 1999, but missed most of his first year in the midwest due to injury. In 2000, Meola was named League MVP, Goalkeeper of the Year, and MLS Cup MVP as he led Kansas City to the championship. He set a new the league record by recording 16 shutouts. Meola played for the Wizards through the 2004 MLS season. That year, an injury forced him out of contention. Bo Oshoniyi took over the goalkeeping position, and Meola was not asked back for next season. He was then re-acquired by the MetroStars in June 2005. Meola was named to the MLS All-Time Best XI after the season. Following the 2006 season, Meola was waived by the team, now known as the New York Red Bulls. However, he signed a contract with the indoor New Jersey Ironmen on August 14, 2007. Meola made his U.S. National Team debut on June 10, 1988, against Ecuador. Meola's second cap came in a June 4, 1989 victory over Peru in the Marlboro Cup which won the U.S. the cup. The team took the trophy to the Scots-American Club in Kearny, New Jersey. After the party, Meola drove back to the team's hotel, dropped the trophy at the front desk and drove home. As he remembers it, "A week later Doug Newman called me up and asked where the cup was. I told him I'd left it at for him at the hotel. . . . I'm sure they got it back. Back then there weren't too many cups in U.S. Soccer." Later in the summer, the national team went on a tour of Italy, playing several Serie A teams. At the time, David Vanole was the U.S. starter, but he and Meola had traded goalkeeper duties over the previous month as Vanole fought USSF on a contract dispute and attempted to get his burgeoning weight under control. U.S. coach Bob Gansler intended to start Meola against A.S. Roma, but Meola was injured in a freak accident when a ball struck his head during practice. Vanole started in his place, but let in three weak goals in a 4-3 U.S. victory.Gansler benched Vanole, who never again played for the U.S., and turned toward Meola as his starting keeper. Meola went on to play the remaining U.S. qualifying games for the 1990 FIFA World Cup, including the famous 1-0 victory over Trinidad and Tobago which clinched a spot in the finals for the U.S. He then played every minute in goal for the US in the 1990 FIFA World Cup. 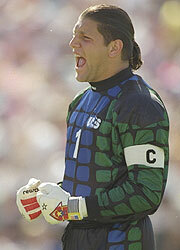 Meola remained the keeper of choice for the U.S. national team from 1990 through the 1994 FIFA World Cup. At that tournament, his play and ponytail made him a recognizable face around the country. After the U.S. loss to Brazil in the second round of the World Cup, Meola informed the U.S. coach Bora Milutinović that he intended to pursue a professional football career as a placekicker. Milutinović never called Meola back to the U.S. team and it was not until January 1999 that Meola again played for the U.S. By that time, Kasey Keller and Brad Friedel were competing for the starting goalkeeper spot on the team and Meola never regained the first team place he had enjoyed in the early 1990s. However, he continued to play for the U.S. and earned his 100th cap in 2006. He was the third-choice goalkeeper at the 2002 FIFA World Cup behind Brad Friedel and Kasey Keller. In July 2007 it was announced that Meola had signed with the New Jersey Ironmen, an expansion team in the Major Indoor Soccer League. The team played in the new Prudential Center arena in Newark, NJ. As starting goalie, Meola led the team to the playoffs in its first year.